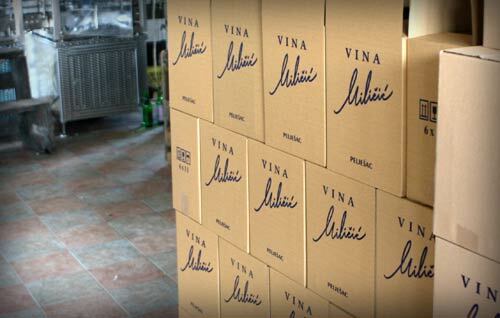 Miličić is an easy winery to find in Potomje, as it’s quite big and continues to get bigger. The amazing thing about this is that Pavo Miličić isn’t starting with the foundations of a former collective. He isn’t even starting with that much family history in winemaking as they stopped making wine once the collectivization of the Communist government took over. In fact, he used to be a ship captain for luxury cruises and the winemaking was just a hobby for the off season. This hobby has continued to grow and expand over the years to the point where Pavo quit the captain gig about 10 years ago to focus solely on making wine. He is making a great number of different wines but the core is Plavac Mali. His basic Plavac is a nice, simple wine with a good strong tobacco nose that also has a lot of oak. The Postup takes all the elements of the simple Plavac and bumps them up a notch, making it a more complex Plavac. His Dingač gets a solid burst of berry elements in the nose and body as is usually the case for Dingač. Its dryness really only comes out in the finish. Currently he is using a mix of French and Hungarian oak of which the Hungarian is being phased out in favor of the French. Following is a video that we came across by Percy von Lipinski. It’s more just to show Pavo’s winery as Percy emphatically states a couple of times that he “isn’t a wine guy”. Why someone not in to wine would go to a Croatian winery is more than a curious thing, but hey, for those who haven’t made it, you get a chance to see the Miličić digs. How can i contact Milicic to buy his wine?